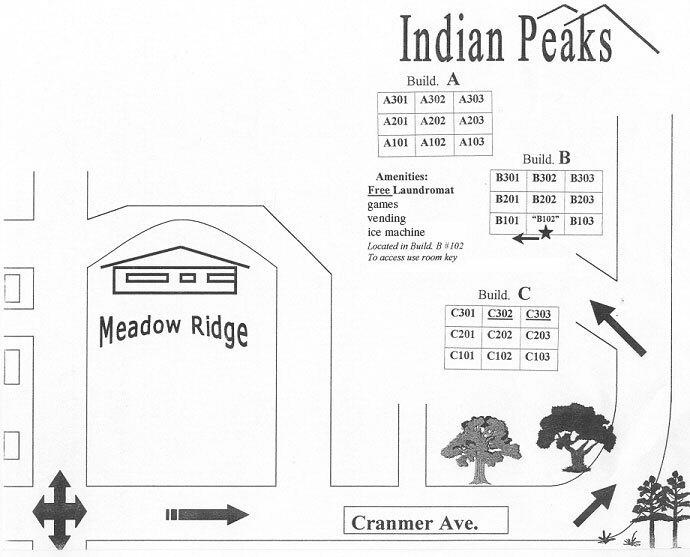 Indian Peaks is located in the Winter Park Ranch area of Fraser. 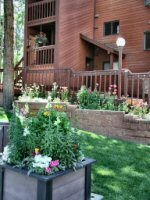 All units have a full kitchen, spacious living area with gas fireplace and cable television with DVD player with a tv in the master bedroom. 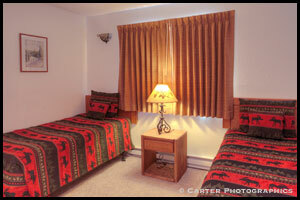 All units have private indoor hot tubs. The 2 bedroom / 2 bath units have a queen in the master bedroom, 2 twins in the second bedroom and a queen size sofa sleeper in the living room. The units are single level (with the exception of C301 which has a loft and accommodates 8 people) and have either a first, a second or a third level outside entry. 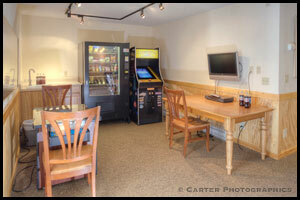 The common area has free laundry, pool table, foosball, air hockey, arcade games, reading area and wireless internet if you bring your own laptop. There is a free shuttle that stops at the entrance to the property every half hour during the winter months. Directions to Indian Peaks: Exit 232 off Interstate 70 to US Highway 40. Follow Highway 40 west over Berthoud Pass (26 miles). You will pass the ski resort (Winter Park Resort) first on your right, then drive through the town of Winter Park, 2 miles into Fraser. Take the right at the stop light at the intersection for the Safeway grocery store. Pass through the next light (at the Safeway parking lot entrance), drive around the corner and up to the top of the hill where you will meet an intersection and the entrance to MeadowRidge. Take a right onto Cranmer at this intersection (you have the right of way as you come up the hill). From here Indian Peaks is a short drive, as the road curves to the left you will see the property entrance just ahead of you on the left. Click here to see a map of the property. 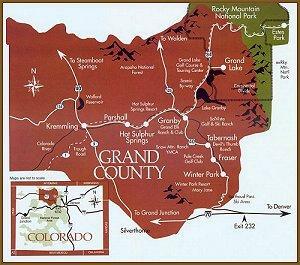 Address for GPS Directions to Indian Peaks: Indian Peaks, 817 County Road 834, Fraser, CO 80442. You can also download and print out the property map. Right click on the desired format below to save a property map to your hard drive.